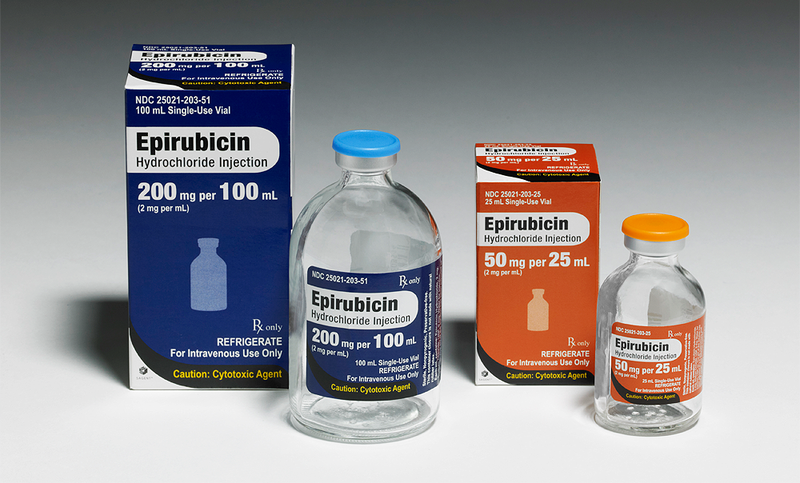 Please see full prescribing and safety information, including boxed warning, for EPIRUBICIN vials. Severe local tissue necrosis will occur if there is extravasation during administration. 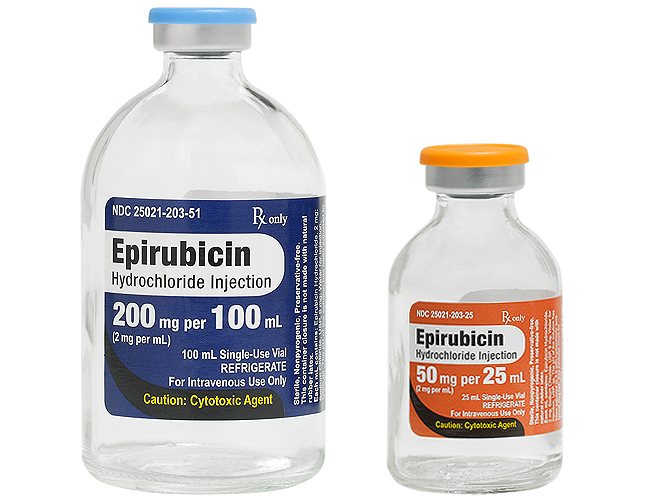 Epirubicin hydrochloride injection must not be given by the intramuscular or subcutaneous route [see Warnings and Precautions (5.9)]. Cardiac toxicity, including fatal congestive heart failure (CHF), may occur either during therapy with epirubicin hydrochloride injection or months to years after termination of therapy. The probability of developing clinically evident CHF is estimated as approximately 0.9% at a cumulative dose of 550 mg/m2, 1.6% at 700 mg/m2, and 3.3% at 900 mg/m2. In the adjuvant treatment of breast cancer, the maximum cumulative dose used in clinical trials was 720 mg/m2. The risk of developing CHF increases rapidly with increasing total cumulative doses of epirubicin hydrochloride injection in excess of 900 mg/m2; this cumulative dose should only be exceeded with extreme caution. Active or dormant cardiovascular disease, prior or concomitant radiotherapy to the mediastinal/pericardial area, previous therapy with other anthracyclines or anthracenediones, or concomitant use of other cardiotoxic drugs may increase the risk of cardiac toxicity. Cardiac toxicity with epirubicin hydrochloride injection may occur at lower cumulative doses whether or not cardiac risk factors are present [see Warnings and Precautions (5.3)]. Secondary acute myelogenous leukemia (AML) has been reported in patients with breast cancer treated with anthracyclines, including epirubicin. The occurrence of refractory secondary leukemia is more common when such drugs are given in combination with DNA-damaging antineoplastic agents, when patients have been heavily pretreated with cytotoxic drugs, or when doses of anthracyclines have been escalated. The cumulative risk of developing treatment-related AML or myelodysplastic syndrome (MDS), in 7110 patients with breast cancer who received adjuvant treatment with epirubicin hydrochloride injection-containing regimens, was estimated as 0.27% at 3 years, 0.46% at 5 years, and 0.55% at 8 years [see Warnings and Precautions (5.4)].